Sam "Trump" Harris is a multi-instrumentalist/singer/songwriter from Houston, TX, and has been a student of music from first picking up the trumpet at age 7. 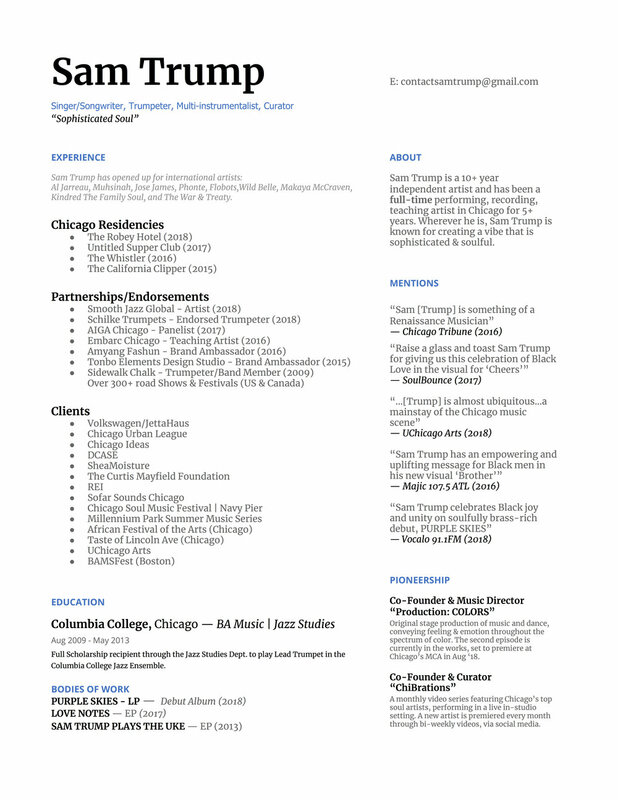 Since moving to Chicago in 2009 to obtain his fine arts degree in music, he has become heavily involved in Chicago's live music scene, and is widely known as a band leader, sideman, mentor, & curator. Wherever he is, Sam Trump is known for creating a vibe that is sophisticated & soulful. A few notable clients are SheaMoisture, Chicago Urban League, Volkswagen Jetta Haus, Sofar Sounds, REI, Chicago Ideas, Navy Pier, BAMSFest. Sam Trump’s debut album, Purple Skies (2018) documents the early maturation of his solo artistry, covering topics of love & romance, family, inspiration, societal interdependence, & the Black American plight. All songs are produced by long-term collaborator & LA based producer, Calvin Valentine. The Official Music Videos for two singles from this album have received critical global acclaim for their positive message and imagery. Watch "Brother" & "Count On Me". • Chicago Music Awards nominee for "Best Male Vocalist 2016"
Sam Trump is also a long standing member of HipHop, Soul, Jazz band, Sidewalk Chalk, who released their 4th album “An Orchid Is Born” in 2017, produced by Grammy Award Winner, Robert “Sput” Searight. Sam Trump has opened up for Al Jerreau, Ryan Leslie, Muhsinah, Jose James, The Wild Belle, Kindred The Family Soul, The War & Treaty & Sy Smith. Has shared the stage with Phonte, Christopher Turner, Shante Chantae Cann, The O'Jays, Jamila Woods, Bilal, Wycliffe Gordon, Christian McBride, Sam Strouk, L'Renee, & Benny Golson. Has been featured on albums with Sidewalk Chalk, Add-2, Rapsody, Cam Be, Lili K, Mykele Deville, Kendra Foster, B Forrest, Kay & King Mason, Calid B, and more. "My aim is to establish myself as a pioneer of new direction within the music scene. Through my writing, consulting, and performing, my ultimate goal is to inspire others to do whatever it is they love most, with the ambition of positively effecting our society. It is my hope that with every path crossed, inspiration transpires."